I was always curious if you’re able to watch sports up there, great post! and Go Tigers! I read your notes about missing the games. I know it is not easy, I too hate it when that happens…you know that we miss what we love and like just for being up there going around the planet at 17.000 mph. I do, I do, I hate it when that happens. You know…I am kidding, a little humor and to remind you of how much we here on the planet admire everyone of you upthere doing the kind of work that only more than brave, special,unique,etc, etc, etc, people would do. Thanks for doing what you do.!!!!! Hey Joseph, my name is Carlos Negron, I’m 27, from Puerto Rico, since I was a kid I’ve dreamed of becoming an astronaut, and as I grew older my passion for flying and space and science has grown bigger too. You are a great inspiration for me and I hope we meet some day. Keep up the good work!!! Hey to all, or all y’all! So glad you mentioned that Suni Williams will be joining Station, 15 July is launch? Her relative attends the school in Denver where I taught. You can imagine my jaw dropping as I was showing a Kindergarten class a pic of the team then on Station. This little voice said,”That’s my aunt Suni”. That was the time when Suni and her sister ran the Boston Marathon “together”. The museum where I volunteer is going to work on a proposal for a direct connection contact with Station. Wings Over the Rockies Museum is devoted to space education. We have a lot of work ahead of us to get the paperwork completed. First and foremost being originally from Puerto Rico it’s a great honor to know there is a Puerto Rican astronaut in space at this moment. I came upon your blog from El Nuevo Dia – the island’s newspaper – online section. Secondly, being a sports fan it was a great post about how you never lose that passion for sports even if you are in outer-space. By the way, the Miami Heat lost yesterday to the Oakland Thunder in Game 1 of the NBA Finals and the Red Sox won over the Marlins (all in all not a good day for Miami sports). Third, it seems from the photo all of you are eating – wonder what’s in those cans. Thanks to NASA. I like the look on the faces of the crew plus they look healthy..
You guys just flew directly over our back yard at 10:11Pm est on a clear and very warm night 90+*F for New England. Looked very smooth. Be well. Just watch you guys for 4minutes@21.:37 over Virginia. Wife and I went out to center of 18th fairway. At 21:36was certain tree line would block view, but no sighting was spot with clear sky. Neighbor saw my flash light and joined us. What a treat, God speed and great job. I so get this post! I have loved me some football ever since I was a wee lass–growing up in Miami during the Dolphins undefeated season, you can imagine it was practically de rigeur! Of course, later I figured out it was way more fun to be on the opposing team, and I thought my dad would fall out when the Dan Marino poster came down and the Danny White one went up! 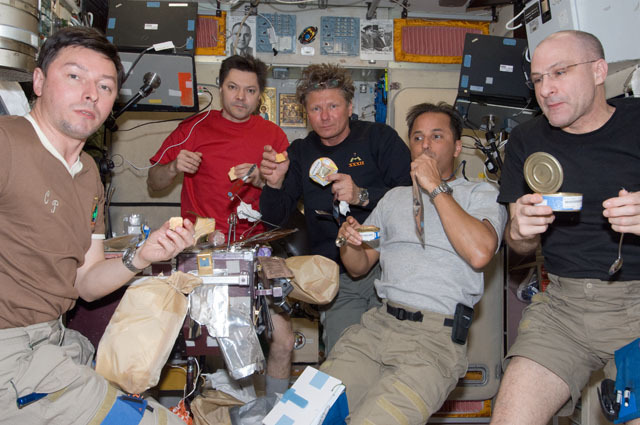 Congrats on your friendly takeover of the ISS, Expedition 32! Though I’ll miss my Don Pettit moments, I have faith you’ll keep me posted and bring interesting perspective 🙂 and please, for the love of pete, take care of Astro Zuc!!! I think you guys are excellent people, so do not worry that soon you will sharing with your friends or family another interesting game. Thank you for helping ensure Humanity’s long term survival as a species! I plan to work for NASA, most likely as an engineer. I guess a thousand years from now, when people are standing on mars, the thought that I, even in some marginal way, helped make that happen, is just such a wonderful notion. And that idea right there, is the closest thing I’ve got to a religion. GO NASA! Take a look down at Arkansas, alright? I’ll be looking at the sky for the ISS for sure. Hi Joe: greetings from sunny San Antonio, TX. This is my fourth post; others didn’t take. Trust the Kings’ Stanley Cup victory satisfies your “fan cravings” for a while. By the way, Pujols is heating with 15 HRs and .271 ave.; not bad for a guy who had 0 HRs and averaged half his weight in April. Visited with Rafaelito and Titi Elsie last week during a family trip to LA; they’re doing just great; cooking was “out of this world”. Hope you all can visit with us. We are following up all your space activities and praying for a safe return. Наилучшие пожелания, (hope that translates to “Best Wishes”), Cousin Jr.